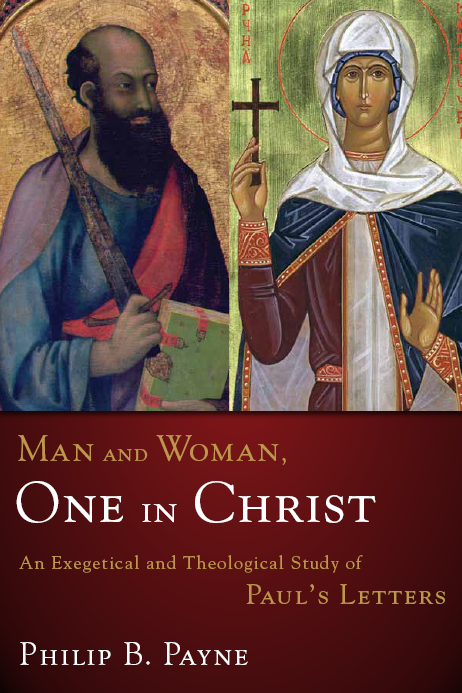 Book Review: “Man and Woman: One in Christ” by Philip Payne | J.W. Wartick -"Always Have a Reason"
Philip Payne’s book Man and Woman, One in Christ (hereafter MWOC) is a monumental volume arguing for the equality of man and woman both in the church and in the home. At over 500 pages (including index and bibliography), it comprehensively covers the range of arguments and presents egalitarianism in a thoroughly Biblical manner. Payne notes that Paul was taught by Gamaliel, who was far more egalitarian than his contemporaries. Given this background, it is implausible that Paul had a low view of women (37). Those opposed to egalitarians (basically, egalitarians are people for women pastors, complementarians are those opposed to women pastors) often portray the position as having its only support in Galatians 3:28. Philip Payne does not base the egalitarian position on this verse alone, but he does argue that the passage provides a strong basis for the egalitarian position. Payne writes, “The natural implication of the equality of male and female in Paul’s teaching is that the gifts of women for ministry in the church should be recognized, welcomed and exercised in all areas of church life, including… church leadership” (104). In 1 Corinthians 7, Paul explicitly parallels the obligations, rights, and conditions of men and women in marriage. Payne notes a large number of verses in which Paul uses the same language for both men and women (105-106). Not only that, but Paul specifically challenges the concept that men should be the spiritual leaders in the home in 1 Cor. 7:14 (107). Payne’s book quickly turns to an extremely in-depth exegesis of the core verses related to the debate over women in church leadership. To put this into concrete terms, Payne’s analysis of 1 Timothy 2:8-15 covers eight chapters and 142 pages; 1 Corinthians 14 has nearly 50 pages dedicated to it, 1 Corinthians 11 is covered by over 100 pages. Payne does not set theology or exegesis to the side in favor of emotional appeals, as some complementarians tend to accuse egalitarians of doing. Rather, he centralizes the Bible as the inerrant Word of God and unswervingly demands that all sides conform to what the Bible teaches, no matter how difficult that teaching may be. Regarding 1 Corinthians 11, Payne notes that the analogy regarding the “head” of woman does not imply authority, as complementarians must hold. Rather, “source” is a better exegetical and philological fit (113ff, see especially 131, 133). Payne further argues that the proper application of 1 Corinthians 11 would draw out the respect and honor men and women should have for each other as equals (214-215). Rather than mincing words, I’ll jump right to the point: Payne argues that these verses are an interpolation. I’ll cover my own thoughts in the section below “Analysis/Critique,” but for now, I’ll focus on Payne’s argument. Payne notes that there are a number of ways offered to interpret the passage, but he argues that the only plausible interpretation of the text is that women must be silent, no matter what, in every circumstance. The reasoning is lengthy, but the primary rationale behind this interpretation as most plausible is the it reiterates the prohibition three times, which, in the 1st Century, would have been seen as an absolute prohibition (218-219). Complementarians who allow women to sing in worship, therefore, are inconsistent in their interpretation of this passage, because they add a qualification which is not in the text (221). Payne, however, argues the text is an interpolation. The evidence is both internal and external. First, the external evidence. The movement of the text itself hints that it was an interpolation which was placed in different parts of 1 Corinthians depending on the textual lineage (227ff). There is also a distigme which is used elsewhere to mark interpolations that is in the last line of 14:33, the correct place to mark 14:34-35 as an interpolation (232ff). Bishop Victor, between AD 541-544, corrected the text to omit 14:34-35 as an interpolation (246ff). Victor’s acumen for detecting interpolations is noteworthy, because he also omits the Trinitarian interpolation in 1 John 5:7-8 (246). MS88 omits the text, likely because it was copied from a manuscript which lacked the interpolation (249). Clement reflects a text without the verses (250-251). He notes other evidence as well (251ff). Payne also notes 9 lines of internal evidence for the text being an interpolation (253ff). These verses occupy the largest treatment in MWOC. The key to properly interpreting this passage, argues Payne, is the context and the church situation to which it is addressed. Context is always important in properly interpreting the Bible, but with letters it is even more important. Payne approvingly quotes Raymond Collins on this point, “…it is the epistolary genre that is most conditioned by the coordinates of time and space, historical and relational circumstances… They are ad hoc compositions whose essential import relates immediately and directly only to the situation that dictated their composition” (291). Payne asserts that scholars know the situation in Ephesus–there was a preponderance of false teaching (296ff). Because of this, it is important to read the letter as a letter designed to put a stop to these teachings. Paul’s prohibition of women’s teachings is tied directly to the fact that false teachers had been praying upon women (299ff). The phrase Paul uses, “I am not permitting” “indicat[es] a new, case-specific injunction in response to a problem in Ephesus that does not carry the weight of church tradition” (321). Payne also highlights the importance of the Greek word oude as conjoining the prohibitions Paul makes in this passage. The word is used throughout the Pauline corpus to “join together expressions that reinforce or make more specific a single idea” (338). Because of this, it is important to note that the word is used to conjoin the prohibitions in 1 Timothy 2:12. The prohibitions are “to teach” and “to assume authority.” Thus the prohibition is not Paul saying women cannot teach or assume authority over man… rather it is “Women should not teach in conjunction with assumed authority” (348-356). But does authenteo mean “assume authority”? Complementarians generally must argue that it means simply “have authority.” Payne destroys such arguments, citing etymological (363-365) and document (365-373) evidence to demonstrate the word means “assume authority [to oneself-385ff].” Payne also deconstructs the complementarian argument to the contrary, showing that Paul used other words to refer to authority in a basic sense (373-380). Importantly, Payne draws out the implications of Paul’s exhortations to women to learn quietly. This was the proper position of students. Paul is not telling women they have no place in the church, he’s calling them to learn in a proper fashion before teaching (see 316-317 for an example of this argument). Thus, Payne concludes that Paul is not prohibiting women from teaching in the church. In the face of the counter-evidence of Paul’s affirmation of women teachers (61-68), the specific context of 1 Timothy, and the proper translation of the Greek words, the text should be read as a temporal restriction on teaching by women in a church struggling with false teachings being spread by women. I have not even begun to draw out all of Payne’s arguments in MWOC. There are many more lines of reasoning including Paul’s affirmation of women in positions of ministry, Paul’s theological axioms which imply equality of man and woman, “salvation through childbirth,” Ephesians 5:21-33 and Colossians 3:18-19 with husband-wife relationships, Titus 1:5-9 and 1 Timothy 3:1-13 and the requirements for deacons and overseers, etc., etc. I cannot emphasize how broad Payne’s line of argument is, and how lucidly he explains his points. The book simply must be read by anyone interested in the topic. There are so many points Payne makes in MWOC that it would be impossible to cover them all. I found Payne’s arguments largely persuasive. That said, I have a few minor notes. First, I am not convinced that 1 Corinthians 14:34-35 is an interpolation. I also think Payne dismisses the possible egalitarian readings of the passage too quickly (219ff). That said, Payne’s arguments are extremely powerful. I would have dismissed such arguments before reading this book, but now I’d say I’m very close to agreeing with Payne that these verses are an interpolation. However, I wish that Payne had did a bit more work on the text to at least investigate the exegetical possibilities. I believe very few complementarians would be willing to accept that these verses are an interpolation, so if Payne had offered other possible interpretations, complementarians might find his case stronger. However, it is the case that complementarians who desire to use this passage to exclude women from the ministry now have the burden of proof upon them to demonstrate that it is not an interpolation, and they must do so with the same careful attention to the internal and external evidence which Payne utilized. Initially I thought Payne might be overstating the case from Galatians 3:28, but he drew out enough parallel passages that it seems pretty convincing that egalitarians can interpret other passages in light of the Galatians verse (Payne does not use this method–he deals directly with the texts said to undermine egalitarianism… I’m merely suggesting that Payne’s work on Galatians 3:28 would allow egalitarians to be justified in utilizing it as a kind of “proof text” by which others must be judged). Payne’s sustained positive argument for the equality of man and woman essentially convinced me of the egalitarian position over a year and a half ago. I have only recently finished the book, but when I first got it and skimmed through the arguments, I realized every argument I’d been using as a complementarian had an egalitarian answer. Not only that, but Payne’s critique of the complementarian position undermined the theological position which I’d held my entire life. I think it takes a great deal of intellectual integrity to read books which challenge one’s fundamental beliefs, and I have experienced it firsthand. I challenge readers on both sides of the issue to read this book. Man and Woman, One in Christ provides an insurmountable challenge to the complementarian position. Any scholar working on the topic in the future must interact with this magnificent work. I simply must recommend it over and over again. I am thoroughly convinced that egalitarianism has a much stronger Scriptural and theological basis than the complementarian position, and MWOC is one of the works which lead me to that position. Payne’s thorough and thought-provoking analysis of the texts themselves demonstrates the Biblical accuracy of the egalitarian position. His work is one with which all must contend. The issue of women in the ministry is one we [the church] cannot get wrong. A thoughtful, open-minded approach to the Biblical issues is necessary. Let us make men and women one again. Philip B. Payne, Man and Woman, One in Christ (Grand Rapids, MI: Zondervan, 2009). « Genetic Evidence and the Book of Mormon: Did any Native Americans come from the Middle East? I agree, NAA :). This is, in my opinion, the best book on the topic that I know of, and I’ve read fairly extensively on the topic. There are others I could recommend! I put together a short lit review: http://odayfam.com/is-1-corinthians-1433-35-an-interpolation-a-literature-review/ (I actually did this awhile back on the hermeneutics StackExchange site, but posting on my blog also). I did a little literature review on this. Not sure if I posted this earlier. WP was acting funny.